Keller Mortgage was designed to save consumers thousands of dollars on their real estate transaction. By being the innovative solution to the traditional mortgage. KW agents and consumers benefit most by saving the consumer thousands with the ZeroPlus Loan. We eliminate traditional costs and pass the savings directly to the consumer, at the same low rate! Traditional lenders pay real estate agents and real estate companies through “Marketing Agreements”, “Joint Ventures” or “Lead Purchase Programs”. We don’t, because KW agents benefit most when the consumer saves. Traditional lenders charge more to cover the costs of local offices and expensive advertising and marketing campaigns. By eliminating those costs, we maximize consumer’s savings, on each transaction. We do more loans than traditional lenders so consumers get a better deal! CLICK HERE TO DOWNLOAD OUR APP AND START GETTING PRE-APPROVED! Use the KW consumer app to seamlessly connect your data to your transaction, simplifying the process and communication for the agent and consumer. KW agents can get consumers started by sharing their branded app. Our Loan Officers are experienced and more productive. Averaging 9+ years in the industry and 20+ loans per month (Traditional industry average is 2.4 loans per month). Ask our LO’s about our 5 star ratings from agents and consumers. 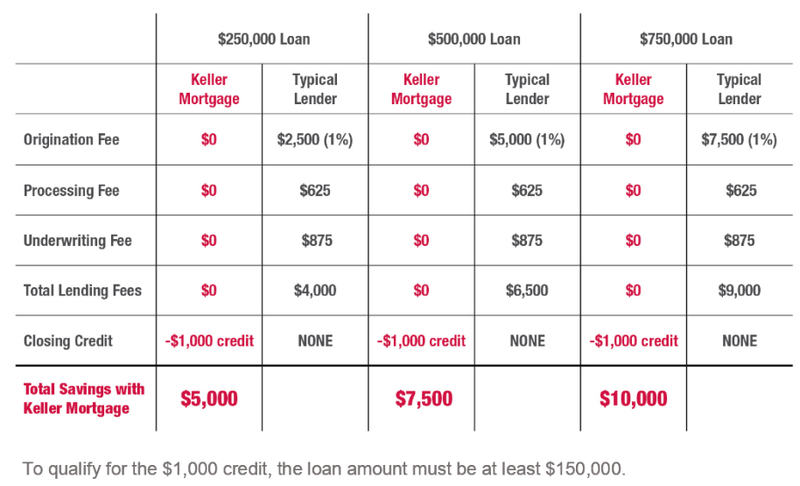 I compared Keller Mortgage against my preferred lender for years. KM was $3000 less in costs and .125 better on rate. We saved $6,500 by using Keller Mortgage which helped in furnishing our new home. – Don & Mary Fran C.
I did shop around for a mortgage lender. I ended up saving over $5,000 with Keller Mortgage. I saved over $2,200 compared to one lender I was considering, and over $2,500 compared to a third lender! When I presented both of them Keller Mortgage pricing, they both told me that it was a home-run, and I should take the deal. They couldn’t compete, and didn’t blame me! I will have no hesitation using Keller Mortgage in the future, or recommending other people to use as well. I saved nearly $5,000 working with Keller and with the savings, we were able to fund half of our kitchen remodel. Keller Mortgage moved quickly and I was able to close on schedule in just under 30 days as planned. Such a refreshing experience compared to a previous experience with another lender! Thank you!!! Everything, including the closing process, was as smooth as any process we have ever been through. Our savings by using the Zero Plus loan program with Keller Mortgage was 4,366.40. We have already told our friends and family all about it, and hope to repeat this experience in the future!! I originally chose to get pre-approved through my bank. Then my realtor told me about Keller Mortgage. Not only did I get pre-approved with a lower interest rate than my bank, but they were going to give me additional credits during the closing process! Win-win! Everyone I worked with at Keller Mortgage was so knowledgeable and friendly I would recommend Keller Mortgage to all my friends and family since my experience with them was nothing but positive! Initially, I went with a different mortgage company. The original mortgage company was slow and arduous! So slow, in fact, that I lost out on an offer on a house. When I finally found a second home, my realtor recommended that I try Keller Mortgage, as I didn’t want a second home to slip through my fingers. From the very first phone call with Keller Mortgage, I knew this was going to be a great experience! We were ready to close early with no hiccups and no stress! Buying a home with Keller Mortgage is the best home buying experience out there! My experience working with Keller Mortgage was very positive. Any time I had a question or concern, they were very quick to respond and get the answers we needed. We were also thrilled to know that we had saved $6,741.00 on our closing costs using Keller Mortgage. All in all, I’m so glad we chose Keller Mortgage and I would highly recommend them to anyone considering buying a home. I used Keller Mortgage for my first home purchase and I could not be happier. I had many questions and they explained everything. They also had the best rates, most transparency and kept things on track so we were able to close when I wanted. Keller Mortgage offered the best rate and closing costs of all options and their customer service has been fantastic. I would recommend their services to anyone interested in buying a home. This website is not intended for solicitation of NY property mortgage loans and is not licensed to do business in the State of New York.